Galaxy Glen is set for his second start at Echuca on Thursday. The three-year-old son of Master Of Design is in race one, the De Bortoli Wines Maiden Plate over 1618m with Rhys McLeod to ride and jumping from barrier six after scratchings. Galaxy Glen finished unplaced at Werribee on debut last month after showing early speed and Mike Moroney said has improved for the experience. “He’s a horse that has taken a long time to work things out but he’s slowly getting there and has definitely improved for the run,” Moroney said. 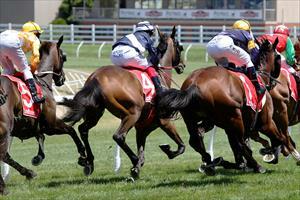 “The scratchings have helped with the barrier and he does have good gate speed. “I don’t think the rain overnight will prove a problem and if anything the ease in the track should suit him.